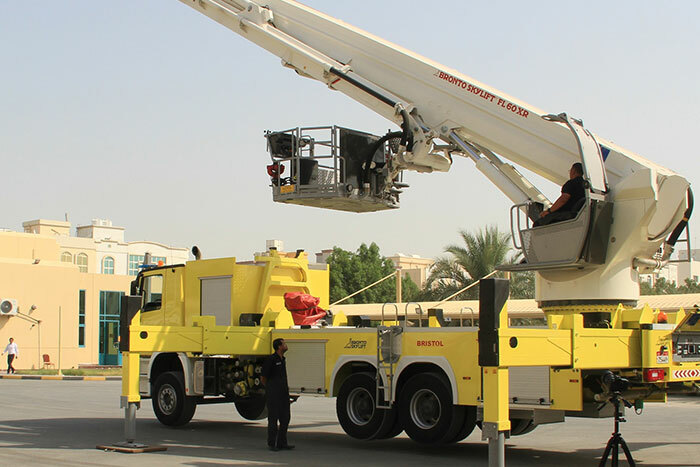 Bristol Fire Engineering, an Abu Dhabi-based establishment specialised in firefighting services and equipment, unveiled the latest technology in aerial hydraulic platforms through live demonstrations organised for senior Civil Defence and Ministry of Interior officials. Delegations from the Ministry of Interior and Civil Defence departments were shown the extensive capabilities of the new ‘FL60XR Bronto Skylift’, with its new control system generation (B+5), at a series of events held at the Muweilah fire station in Sharjah. Capable of extending to up to 60 metres, the Bronto Skylift has been designed to address the increasing need for Civil Defence teams to access greater heights and tackle blazes in residential, office and hotel skyscrapers across the UAE. A truck-mounted platform system, the FL60XR has been adopted by Civil Defence departments across Europe. Its telescopic hydraulic design, complete with a turntable ladder, allows operating crews to perform their duties with unrivalled versatility and usability. Firefighting teams using the FL60XR also benefit from a large rescue cage, which can be equipped with medical equipment including stretchers, escape ladder and powerful, pressurised water hoses. The new version of Bronto’s aerial platform system has a horizontal outreach of 31.5 metres with a maximum rescue cage load of 500kg. The transportation length is less than 12 metres, which meets general international regulations. State-of-the-art collision guard sensors provide the operator with warnings to avoid the cage impacting any buildings or other infrastructure; while loud speakers and radios allow for clear communications between personnel. Civil Defence chiefs and Ministry of Interior officials were also shown how easily and quickly the system can be deployed. Access to the latest high-level platform systems is of great importance to these departments in the region after having to tackle a few high-profile blazes in tall residential towers in recent years. Bristol will provide fabrication expertise and after-sale care for the FL60XR Bronto Skylift system at its Abu Dhabi service centre and manufacturing facility, which currently serves Civil Defence and Police teams, as well as the oil and gas sector, rescue operations and utility companies.